President Obama is taking steps to close up the "diaper gap" that very much exists in this country—here's how he plans to make the essential item more accessible for all families. We all know that raising children is expensive—and while it puts more of a financial strain on some families than it does on others, all children need certain essentials...and diapers are absolutely among these. But there's a "diaper gap" in this country, a sharp divide between families who can shoulder the (admittedly high) cost of providing their children with necessary diapers and those who cannot. We're all aware of the wealth disparity, but it's also easy for us to underestimate it—that's why it might come as a huge surprise that one in three families struggles to afford diapers. This isn't just a financial issue, it's also a public health crisis: Families often stretch the time between diaper changes and cut rent/food expenses to counter high diaper costs. 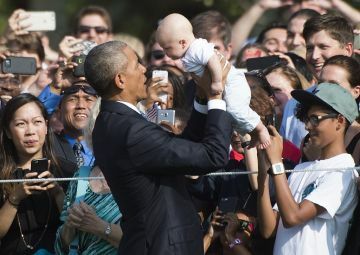 That's why President Obama has rolled out an initiative to make diapers accessible for all families. This isn't a new endeavor—as we've previously reported, the White House rolled out the initiative some time ago—but it does continue to expand, and a governmental statement reflects some of the most major changes. Companies like Jet, Huggies, Pampers, The Honest Company and Baby2Baby are in support of these efforts: They'll donate diapers to the National Diaper Bank and other non-profits. You can join the movement, too: Simply share your stories with the hashtag #DiaperGap or get involved by hosting a "Diaper Drive" for low-income families in your area. While a lot of families are able to save money by ordering diapers online or signing up for subscription services, some have barriers that make this difficult or impossible—maybe they don't have Internet access or available credit, for example. There's a systematic divide at work here—and we can only hope this program continues to grow and eventually close up the diaper gap.